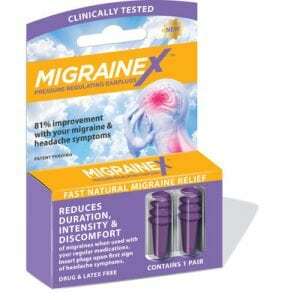 MigraineX: Do 'clinically proven' ear plugs live up to the claim? Do you have migraine attacks? Use a $12 over-the-counter ear plug-type device called MigraineX, a recent news release insisted, and you’ll experience an 81% improvement in weather-related migraine headaches. Some news organizations took the PR bait. Fox 4 Kansas City included the product in a news segment on natural, affordable migraine remedies, parroting the news release’s claim that the product is “clinically proven” to help reduce weather-related migraine pain and symptoms. Likewise, an Atlanta Journal-Constitution article described MigraineX as a “new approach” for treating migraines triggered by changes in barometric pressure. The piece was syndicated and ran in several other newspapers. MigraineX, made by Cirrus Healthcare Products, is marketed along with a free app that alerts users to barometric changes that are said to be a possible migraine trigger. The app, which made it into a Wall Street Journal health story in October 2016, tells users when it is time to proactively insert the ear device. 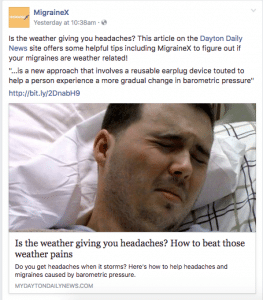 MigraineX shares positive news coverage on its Facebook page. More examples of positive news stories are shared on the MigraineX Facebook page. As someone who gets migraine attacks, I’m well aware of how difficult they are to treat. MigraineX was being touted as “clinically proven,” and the product packaging states it’s “clinically tested.” It’s not the first time I’ve seen phrases like these thrown around in a news release or in drug store aisles. But do they mean anything? The study surveyed about 40 users’ perceptions of improvement when using the product. However, no actual clinical data was recorded about migraine frequency or intensity. There was no control group to detect the placebo effect. Also, the volunteers were told to use MigraineX along with their regular migraine medication, making it impossible to know if it actually helped or by how much. In other words, MigraineX was hardly “clinically proven” to work. And none of the news stories we saw pointed out any of these caveats out to readers. After looking at the study, Adam Cifu, MD, didn’t mince words. Via email, he described it as “utterly worthless.” Cifu is a professor of medicine at the University of Chicago and a HealthNewsReview.org contributor. 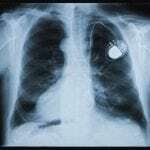 The FDA regulates medical devices and products that claim to or are intended to be used to diagnose, prevent or mitigate a disease or condition. 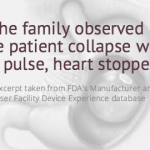 However, the FDA’s regulation of medical devices is far less stringent than for drugs. Stephanie Caccomo, an FDA press officer, says her agency can’t comment specifically on MigraineX and how it is marketed. 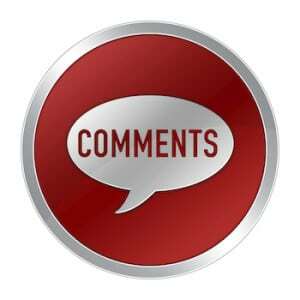 She can say that as of Dec. 13, 2017, MigraineX was “not cleared or approved” by the FDA. The Federal Trade Commission (FTC), the government agency that protects consumers from deceptive business practices, couldn’t answer questions about MigraineX. Mary Engle, the associate director for advertising practices at the FTC, did say that “generally, if a company claims a product is clinically proven to show a benefit, then it must be tested in a reliable way by experts in the field.” However, the FTC doesn’t need to pre-approve a company’s claims. They only open an investigation if potentially misleading claims come to their attention after the product is on the market. 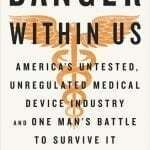 When the FTC conducts an investigation, says Engle, it looks at the quality of the studies the company provides. Typically, she says, these studies “have to be randomized controlled clinical trials” that include a sufficient number of subjects and were properly analyzed. Some might wonder what’s the big deal about a product that sells for $11.99 and has no side effects? According to the Migraine Research Foundation, 38 million men, women, and children in the U.S. alone get migraine attacks. Most would do anything to prevent or stop the pain they experience, and for many something that costs $12 might be worth a try, especially when they hear that it’s “clinically proven” in a news story. It’s misleading promotion, Cifu noted. You night like the reply from MigraineX.